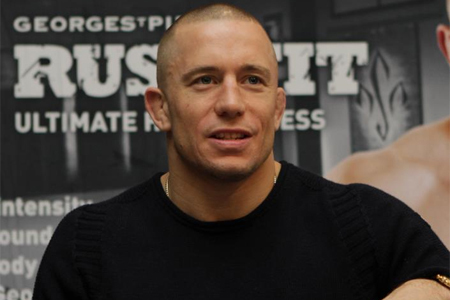 Welterweight king Georges St-Pierre (Pictured) has been eyeing a November return since undergoing knee surgery this past December. It was announced Wednesday the UFC is planning on hosting a show in GSP’s backyard of Montreal, Quebec, Canada on November 17th. If not, St-Pierre gladly connected the dots for you. The 30-year-old claimed his recovery is ahead of schedule and he would love nothing more than to resume his illustrious career in front of his hometown peeps. “My rehab is going really well. My doctor says it is the fastest rehab they have seen for an ACL surgery,” the French-Canadian stated at Wednesday’s press conference. “Even though I’m feeling almost 100 percent right now, I’m halfway through my rehab and I can’t push too much because my graph is still not fused properly. All signs point to interim welterweight champion Carlos Condit riding the pine until St-Pierre returns to action. It’s a wise move from a financial standpoint, as “The Natural Born Killer” can cash in on a blockbuster pay-per-view payday in a title unification bout against the Octagon’s biggest draw. As far as UFC president Dana White is concerned, he won’t be pushing “Rush” to come back too soon. He simply wants his golden boy to return to form when he does step back inside the cage. “It depends on when he is healed and when the fight [with Condit] could happen,” White expressed. “Obviously, Georges St-Pierre fighting anywhere around the world is big. Georges St-Pierre, I’ve said it many times, he’s pound for pound the biggest pay-per-view star in the sport.